I dislike marking so much that sometimes I wonder if I can actually do this academic gig for the rest of my career. It’s hard to explain my dislike because I also like it at the same time… It’s great to see how students are doing, and I particularly like marking reflective assignments where my students discuss their learning, plus assignments where they’ve built something, like a website, or made a video. But no matter how much I like marking particular assignments, the relentless grind and the tedium that sets in after the first handful really gets to me. Part of the problem is that I give stacks of feedback and I can’t seem to stop myself from doing that, which means I am quite possibly the world’s slowest marker. I also find it really hard not to copy edit and write stacks of feedback on the assignment document itself. But I have found a method for marking that is speedy for me and means the students get heaps of feedback: audio recording my comments. A couple of years ago, I slipped two discs in my lower back right when all my marking for the semester came flooding in. By necessity, I had to come up with a way to mark while lying flat on my back, and necessity is, of course, the mother of invention! So I came up with a solution where I put criteria sheets in Dropbox and used Good Reader on my iPad to highlight criteria and write the mark on the sheet. Then I saved them back to Dropbox. At the same time, I recorded my feedback on my phone using Voice Record Pro. After I made each recording, I modified the filename to match my normal naming convention, and saved them to Dropbox directly form Voice Record Pro with a single tap on my phone. In this instance, I was marking videos on YouTube, so I just played those on my iPad mini while recording on my phone and annotating the criteria sheet on my iPad. And it worked well. In fact, the audio recording worked great (highlighting the criteria sheets in Good Reader was a bit of a pain, to be honest, but served the purpose). I have used voice recorded feedback on and off since then, but I’m going to make a wholesale switch to recording all my feedback. The great thing about it is that students get more feedback but it takes me less time. I highly recommend Voice Record Pro for iPhone. 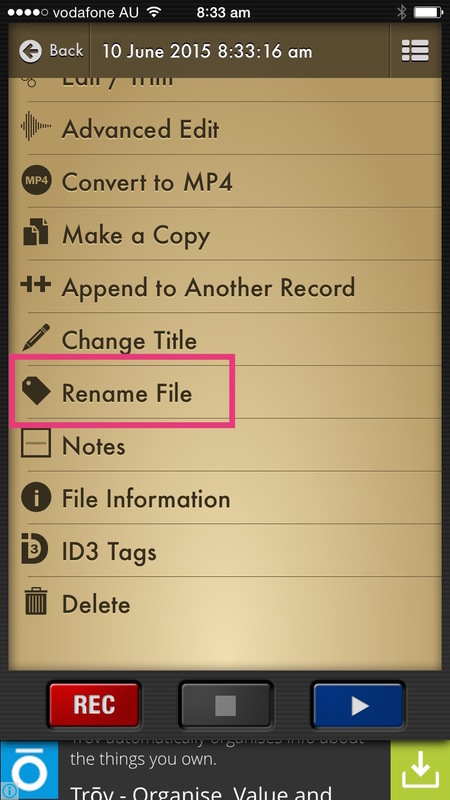 The quality of the recordings is really good and the ability to rename the files easily in-app and then tap to save them to Dropbox is super handy. In case you’re interested in giving this a try, here is my workflow. Open the assignment file and criteria sheet on your computer. In Voice Record Pro, tap the ‘REC’ button. Note this will not start the recording, but will take you to a settings screen. 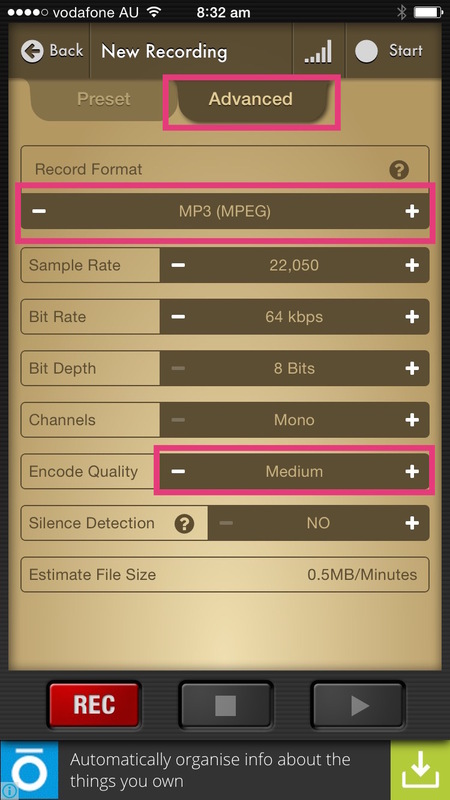 For the first recording, you will need to click on the ‘Advanced’ tab and choose ‘MP3’ as the format (the app records in MP4 format by default). I also recommend choosing ‘Medium’ for quality. These settings should stick for subsequent recordings. Pause the recording and start working through the assignment. 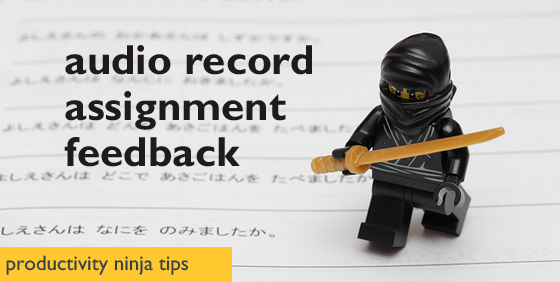 Restart the recording to make comments as you work through the assignment. When the recording is complete, tap the stop button. 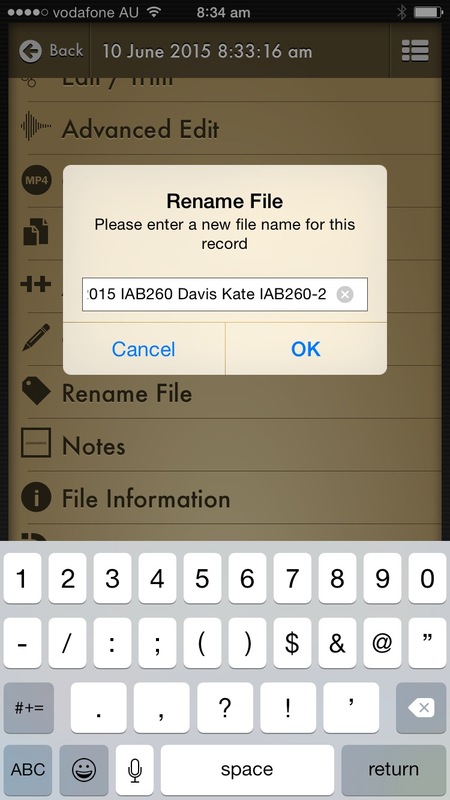 Change the filename to match your preferred naming convention – I name my files* like this: 2015 IAB260 Davis Kate IAB260-2. 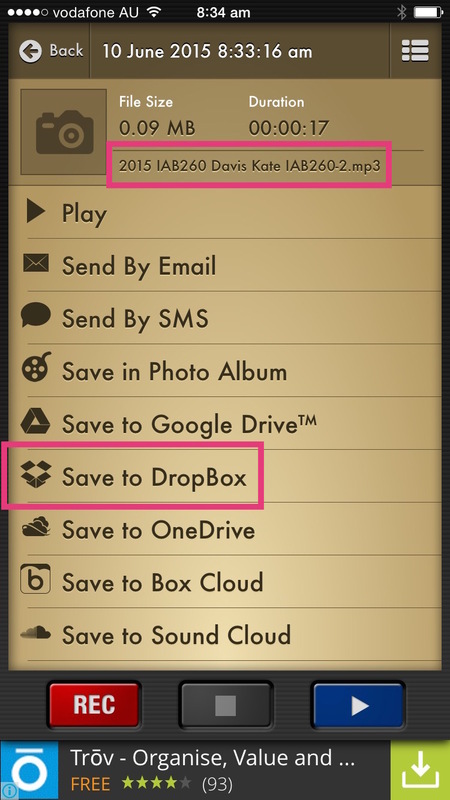 Save the file directly to Dropbox from the app, just by tapping ‘Save to Dropbox’ (note the new filename appears at the top of the screen). I highlight the criteria the student has achieved and write a grade on their criteria sheet. I use the same file name for the criteria sheet except I add ‘CRA’ at the end, so the file name is 2015 IAB260 Davis Kate IAB260-2 CRA. And then I do it all over again for the next one! At the very end, I grab all of the audio files and criteria sheets and whack them into the same folder. Because I’m pedantic about file naming, everything files nicely, which speeds up the process of returning the assignments to students. Just a note on file size: If the files are too big, you can import them into iTunes to compress them. You just need to change your import settings first.